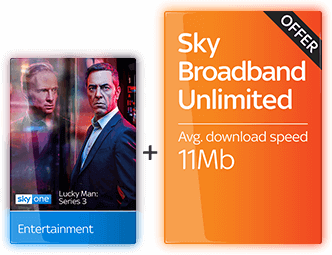 Exclusive Offer: Join Sky with Sky Entertainment HD, the new Ultimate On demand pack - over 500 Box Sets and Netflix - and Sky Cinema HD. Add optional Sky Broadband and call plan. 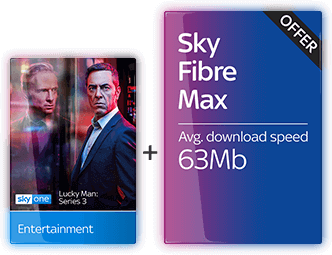 Exclusive Offer: Join or switch to Ofcom's 'Best performing major provider'^, with Sky Fibre Max or Sky Broadband Unlimited and get up to £13.99 OFF per month for 18 months. Plus, FREE activation and your entire setup for just £9.95! Wonderful customer service from Lisa today. Quickly sourced a perfect package to meet all my needs. 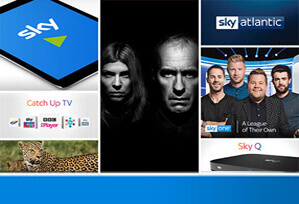 Take advantage of our independent guide to Sky Offers for New Customers. We broadcast this weeks news on exclusive online Sky deals, vouchers, installation and free Sky box offers. Browse all the latest deals at a glance, with clear information, articles and comparison tables. 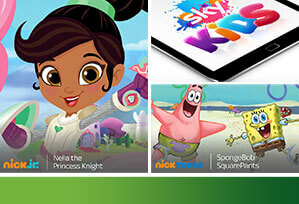 Returning Sky Customers are eligible for our featured offers after only 12 months! Finally, place your order direct with Sky and take advantage of our exclusive online offers. Explain Sky TV to me? Sky Q is latest incarnation of the award winning Sky+HD box and is now offered the customisable Entertainment bundle. With more flexibility than ever, you can add-and-drop Box Sets, Kids, HD and Sky Sports packs on a rolling 31-day contract. Sky Cinema, Multiscreen (formally 'Movies'), and Sky Sports (18 month option for discounts) can also be included with your Sky Entertainment bundle. Sky Q boxes come via two choices: Sky Q 1TB and Sky Q 2TB. Sky Q allows you to pause TV and pick it back up on another device, while Sky Q 2TB also boasts 4K Super HD capabilities, seen as the future in home entertainment. Sky Q Multiscreen: The Sky Q mini box is an additional piece of kit, which allows you to watch Sky TV in more than one room of your home. 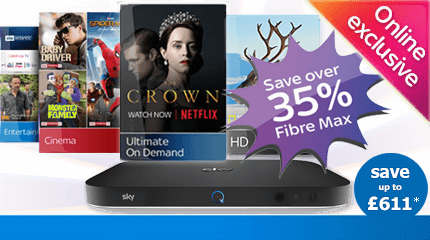 You can customise your Sky Q package in just the same way as any previous Sky+ bundle. Do I need to take Sky Broadband and line rental? Sky TV is available on its own, meaning you do not have to take Sky broadband or line rental. However, Sky Broadband, although available without Sky TV, is only available when you take Sky line rental. Sky line rental currently costs £18.99 per month and this cost is now included in Broadband prices. So what box will I receive when I place my order? All Sky TV orders placed here online include the latest Sky Q boxes (either the 1TB or 2TB box, depending on your selection). 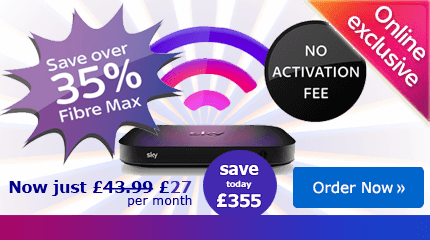 If you place a Sky Multiscreen order, then you will receive a Sky Q Multiscreen mini box and additional mini boxes as required (you can connect up to four). Please refer to your Sky basket as you build your personalised package. What are the comparative offers and subscription options for the new Sky Q boxes? What are the main differences between the Sky+HD box compared to the Sky Q box? Previously Sky+HD box customers received High Definition TV offering five times the picture detail compared to Standard Definition TV. Sky Q 2TB now trumps that with UHD or 4K (as it is also known) with 10 times the picture detail of traditional TV definition. The new Sky Q box also offers more storage then the Sky+HD box for recording programs. You can also record up to 4 programs at once while watching a fifth with Sky Q, as appose to recording 2 and watching a 3rd with Sky+HD. How many HD channels does Sky offer? Sky 'Entertainment' (formally the Original bundle) offers 22 HD channels. In addition, all Sky Sports and Sky Cinema channels now come in HD as standard. 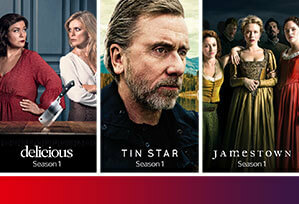 For just £5.00 per month extra - the HD bolt-on pack offers a further 40 HD channels. How long does it take Sky to install? Sky products and services are usually installed and activated with-in 2 weeks of your order with an average of 6 days. Once you have ordered, Sky will contact you regarding a time slot. Appointments can be arranged around both availability and a time that suits you. Then a Sky engineer will contact you and install your Sky TV package. How long am I contracted to Sky? Once you order your Sky TV Package you enter into a 18 month contract (*unless otherwise stated). The Box Sets, Kids, HD and Sports packs can be added on a 31-day rolling contract. Sky Fibre Broadband services are also subject to a 18 month contract. 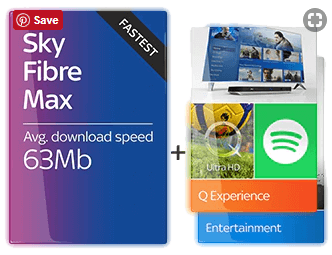 Sky Broadband Unlimited (Sky's ADSL Broadband service) is also subject to an 18 month contract. I am a returning Sky customer, what offers can I get? Returning Sky customers are eligible for new Sky TV offers after 12 months of being a non-Sky TV customer. If you have left Sky within the previous 12 months, it is still worth placing an order, as the automated system will evaluate your eligibility and notify you of just what you can order and at what cost. I am already with Sky, can I get any upgrade deals as an existing Sky customer? Free weekend land line calls to anywhere in the UK (not including the channel islands). Now includes free off-peak calls to UK mobiles. Includes off-peak calls to 0845 and 0870 numbers. Free anytime land line calls to anywhere in the UK (not including the channel islands). Now includes free anytime calls to UK mobiles. Unlimited UK land line calls at anytime. Includes free anytime calls to 0845 and 0870 numbers. Unlimited calls to 50 international destinations. If you do not order a Sky Talk package with your Broadband service, simply pay for the calls you make with this standard Talk service. Available to those with a Sky Talk package and a BT compatible line. New Sky customers who don't currently have a BT compatible line may be able to get one installed through Sky. Set-up cost = Free to switch from a BT line. Or between £20 - £39 if you're switching from a cable line or need to have a land line installed (depending on your property).